Perspecta (NYSE: PRSP) has received a potential one-year, $787.3M contract extension to continue to provide support for the U.S. Navy’s Next Generation Enterprise Network program. Space and Naval Warfare Systems Command made the award as a modification to the existing NGEN contract to extend by another year the ordering period, the Defense Department said Wednesday. “As a new company, Perspecta is bringing a fresh and innovative approach to NGEN. Sailors and Marines will see real benefits from our experienced team, coupled with new thinking and enhanced capabilities that only we know how to make work on NMCI,” commented Mac Curtis, president and CEO of Perspecta. 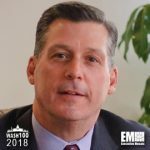 “Perspecta is the best combination for what the Department of the Navy needs now: a pure-play government services provider with a mission mindset and the industry’s most experienced team at transitioning highly-complex, large-scale IT environments while maintaining secure and reliable network operations,” Curtis added. Work will occur in the U.S., Europe, Japan, Korea and Guam through Sept. 30, 2019. Perspecta inherited the contract from DXC Technology’s (NYSE: DXC) former public sector business that merged with Vencore and KeyPoint Government Solutions in June. The modification came nearly two months after the Navy announced plans to release a solicitation for the NGEN recompete contract’s service management, integration and transport portion. A Perspecta-AT&T (NYSE: T) team intends to pursue the follow-on contract’s IT services segment.